I hope you are having weather as nice as we have had the past few days. We've had the summer warmth with the lingering crispness of spring in the air. I love the wind on a sunny day. That said it has been an emotional week. Back from my travels to ULE I started this week a bit pooped. Lately it's been work work and work some more with nary an opportunity to play. You might think that with all my wizardy ways I never have to do much. (Oh you sad sweet little thing how little you know). It's actually the opposite. I am constantly involved in about five projects it seems. For the most part I don't mind, but lately I haven't had much social time with friends. There hasn't been a game night in months, nor a craft night either. I haven't been to the movies since January. All work and no play makes the Mooneagle an unhappy camper. I know what you're thinking, "But Mooneagle you love your work. You should be just ecstatic to be doing what you love." True I do love my work. However for the last few months I have been doing a lot of beta testing, tweaking, and prepping for upcoming projects. As a result I haven't worked with new clients. This year has been a tough one for my business. While I understand that I am currently in a refining and upgrading phase for my skills (both artistic and healing work) the result is that I have been running around doing a lot for very little return. Don't get me wrong my bills are paid, I eat well, and I have a safe place to rest my head, however I haven't had any extra to go out and explore. As a result I've been feeling a bit undervalued and unappreciated not by the people around me, but by life in general. So I've been down. It happens. It used to happen a lot more frequently. It used to be the space I lived in, the kingdom of Melancholy. It was something I spent years struggling to overcome. For the most part I have. A majority of the people who know me think of me as joyful, exuberant, and centered. Well like everybody I get down sometimes, I get scared, and I get pessimistic. I could view it as a personal failing given what I do. I am expected to be undaunted, unstoppable, and the rock of sanity. (Sanity, really people you must not be renting head space if you think that's what I'm about). The fact remains just like all of you I have my ups and downs. Many times I pick myself up and dust myself off, other times I need a hand up to get unstuck. (Thanks Sherry)! So how about you? Do you beat yourself up when you're feeling blue? Do you beat yourself up for beating yourself up? Do you refuse to ask for help because you don't want people to see your vulnerability? Well here's a cosmic hand up to you. What would happen if you cut yourself some slack for feeling depressed? What if discouragement was your call to action, a trumpet to call in your friends and supporters? Try that paradigm shift on for size, and remember sometimes even wizards get the blues. Each week I do my best to try and glean useful insights from my life to present to you my dear readers. I am not always successful in this. Still I honor my commitment to write. I do hit dry patches from time to time and other times I have to write down all the ideas I have for topics before I forget them. This week I am going to be musing over teaching. For those of you who are not regular readers you may not know that I recently was hired by a wellness center to teach tai chi. This is something I have been practicing for half my life, and I have taught small classes in the past. After seven years of studying with a teacher I was named a Sifu. It was rather a shock when it happened. The term Sifu can be translated as master or as teacher. I usually prefer the latter as I don't feel like the master of anything. Of all the hats I sometimes wear (metaphorically speaking because I'm not much of a hat person) I find the teaching hat to be the most challenging. It doesn't matter what I'm teaching whether it be a crafting technique, energetic alchemy, or tai chi, teaching a concept is much more difficult than getting it yourself. Just because you know a topic very well doesn't mean you can automatically convey that understanding to another person. I remember when I was in art school there were some professors that were brilliant artists, but honestly sucked at teaching anything be it technique or theory. A few had the rare gift of being talented artists and teachers. Teaching is its own skill one that is unfortunately not valued very highly in our society. You only have to look at the way we treat public educators to see just how little we value good teachers. In the East the traditional role of the teacher was one of very high esteem. The term Sifu is a prime example is it teacher or master? It is in actuality both. The bond between master and student was a sacred trust. I am very fortunate to have had gifted and generous teachers on my path. So I do my best to accept the challenge of teaching and to make it all seem to flow. With something like tai chi you have to connect with the intelligence of your own body and convey it to the intelligence of the students' bodies. They have to get it on a visceral level. I can talk about wu wei, the idea of effortless action in our movements, but that is just words. The trick is to get my students to feel it and then cultivate it themselves. It's not easy but it does invigorate my own practice and also helps me with letting go of expectations. I have to meet people where they are and move at their pace rather than rigid linear lesson plan. (I do write those and then rewrite them about twice as often). So how does any of this apply to you? Chances are you've been saddled with trying to convey a skill or information to someone at some point, if not just wait you will. Do you value the skill of teaching? Do you value those who make teaching their life's work? Have you ever considered the amount of effort that goes into teaching and mentoring? Think back on your life, who were your favorite teachers? What did they have in common? Maybe you should take a page out of their book and give the art of teaching some thought. I have had so much go on in the past few weeks I barely know what to talk about. The despacho ceremony at the beginning of the month has already brought in several blessings and opportunities. The most obvious one is that I began teaching tai chi once more. This time in a brand new location. (For those in the Louisville Metro Region check out Wellness 360). I have already taught two classes and have had a wonderful time doing so. My other blessing is that several other venues for my artwork have opened up. One of the things people don't realize is that even when good things happen we experience stress if it is something we're not used to, or if we are uncomfortable with change. (Anyone else out there struggle with that…go on raise your hand). As we transition to new ways of working and being in the world we have to deconstruct some of our former beliefs, routines, and even our self image. It is a good idea to create space around transitions if we can. It pays to give ourself extra time to rest and let the novelty of our life changes sink in gently. When we don't we can easily become overwhelmed as much by the ups in life as by the downs. We need to come back to center no matter what is going on. You would think I'd have learned this by now, but unfortunately I have the habit of burning myself at both ends. From the outside it often can look as if nothing is going on with me. However most of my friends know better than that. I always have several projects going at once, and then when one takes off I don't tend to stop at all. Sleep is usually the first thing I short myself on. This of course is exactly what you don't want to do, when change comes you handle it better if you're well rested. So how does this apply to you? Well do you give yourself the space you need to transition properly? Have you started a new job, relationship, or chapter in your life recently? Are you frustrated because you feel exhausted when things start happening? Well you might just need to go gently with yourself. You might have to treat yourself with great care and tenderness. You don't always have to dive right in, sometimes it is best to wade into the ocean of our lives. Happy Beltane weekend to you. Rejoice for the Summer Court of Faery has taken the throne and will hold it till Samhain (Halloween) night. We are in the season of growth, plenty, and pleasure. I thought what better way to welcome in the nature spirits than to have despacho ceremony for them. 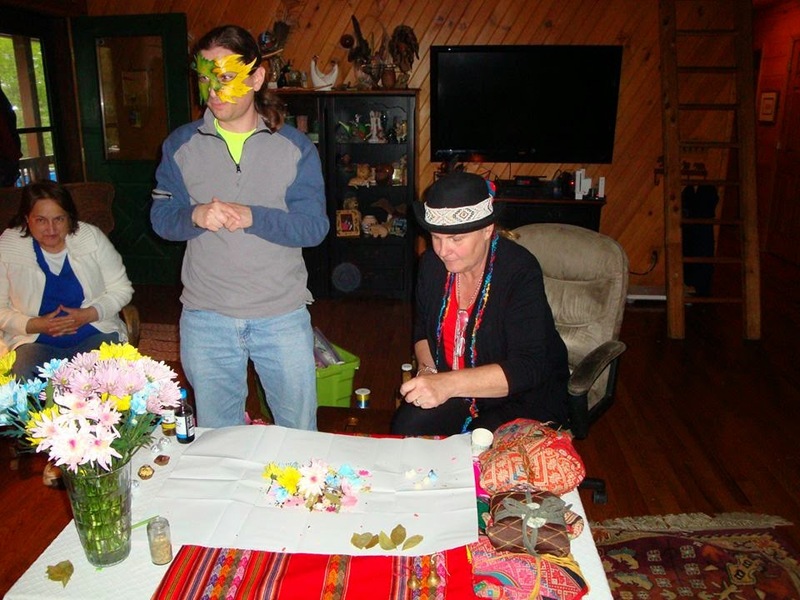 Despacho is a ceremony that comes out of the South American shamanistic traditions. It is basically a gifting to spirit in gratitude for what we've been given and an opportunity to give our prayers a form. We fill a paper with sugar, candies, grains, flowers and pretty things as a gift. We also blow our prayers into the despacho bundle before giving it to the fire to be transmuted into spirit. The ceremony I participated on this Beltane was dedicated to the Faeries. This is their high holy day (it's like Faery Christmas basically)well at least for the Summer Court. Winter Court's big day is Halloween. During the ceremony one of the participants asked me what the best way to honor the Faeries was. I paused for a moment because really there are so many ways you can show them you care for and respect them. I gave the answer, "Plant flowers, and pick up litter." They also like it if you leave food for them, particularly if it is homemade and kind of sweet. Respecting the land and waters goes a long way to earning their trust. Kindness and purity of heart are another (although not foolproof) method of endearing Faery/Human relations. I haven't talked much about Faery in my blog over the past year. My work with them has been more quiet since I opened my healing practice. Although healing work is something they are famous for I have found that not everyone resonates well with them. Not only that but if you mention you believe in Faeries you get looked at funny by other energetic practitioners. For some reason ascended masters, spirit guides, power animals and god-forms are accepted as legitimate in metaphysical circles, but Faeries get relegated to the kiddie table. It's sad really they are excellent guides and can help us open up our hearts to experience the deep mysteries of the world. All that said there are some guidelines for interacting with the Fair Folk. Rule number one, always be polite and never insult them. I can't tell you how many times I have heard of someone making fun of them in magical circles and having to work very hard to clean up the messes that followed. Rule number two never make a promise you won't honor. Do not go back on your word with the Faeries. If you do it will not go well for you, your health, or your business. Rule number three if you come across a place that is a Faery power spot do not litter. (Actually just don't litter in general). If you see trash pick it up if you can. If you trash their home you are inviting them to trash yours. (Think septic tank back ups, roof leaks, termites, etc…). Rule number four if you want there to be some sort of profit out of your association it better be mutually rewarding. You cannot pull one over on them, and if you do somehow manage it you'll be looking over your shoulder for life. You wouldn't try to cheat an angel so why would you think you could cheat an angel of the elemental kingdom? This may make it sound like Faeries are petty, but it is really about respect. They've been around for ages and have watched mankind wreak havoc in whatever environment they settled in. People in general seem to want to test the limits of what they can get away with. It can take many lifetimes to build up the web of life energy in an area, but only moments for a human to come in and destroy the balance. Faeries serve as guardians of the natural world and as such they take protecting it very seriously. So how does any of this apply to you? I truly don't know it is more an informative essay on Faery etiquette and it is far from complete. They are the children of the mystery and for some of you they will be the scent of a home you once knew a long time ago. For me I always have the sense of comfort and home in a place where many faeries gather. My heart feels full and connected. Do you resonate with the elemental realms? Are you honoring your connections to nature? Are you practicing good Faery etiquette? Are you treating the world with respect?